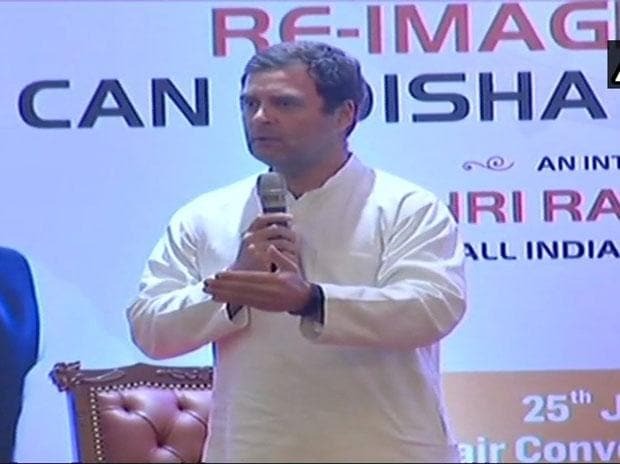 Congress President Rahul Gandhi on Friday targeted the RSS, alleging that the BJP's "mothership" was trying to penetrate and control all institutions and its imprint was evident everywhere be it "North Block and the South Block" which has led to chaos in the country including the judiciary. During an interaction with intellectuals as part of the Congress' outreach efforts ahead of Lok Sabha polls, Gandhi said unlike the BJP, his party "respects decentralisation, independence of institutions and constitutional advances". He said that their fight was against the ideology that "one state, one ideology and one set of people should run the country" and stressed that the nation should be driven by its 1.2 billion people. He criticised the Modi government over the issue of loan waiver to industrialists, implementation of GST and MGNREGA and Ayushman Bharat health insurance scheme. Gandhi said he takes "constant abuse" by the RSS and BJP as a "gift" which has strengthened him as he has learnt a lot from them. He said he will recommend that Prime Minister Narendra Modi read "the Gita (holy book) a couple of times. I also recommend him to read the book 'I am That' by Swami Nisargadatta." The book teaches you how insignificant you are when compared to the universe, Gandhi said. "You currently have one institution called the RSS, mothership of the BJP, which believes it should be the only institution in the country. They want to penetrate into all other institutions and control them," he said. This mindset has led to chaos everywhere in the country, including areas of judiciary and education, Gandhi said. "You can see these imprints of RSS if you go to North Block and South Block. We simply believe that one state, one ideology, one set of people should not run this country. We believe that 1.2 billion people should run this country. We defend this," Gandhi said. The Congress leader also said his party has a view different from the ruling BJP when it comes to functioning of key institutions. "We believe that there is a link between India's success, India's constitution, advancement and institutional independence. So very simply, we respect institutions like judiciary, Election Commission of India, educational system and universities. There is a difference in mindset. "We are much more interested in bringing the voice of people into government and sometimes frankly, when Congress was operating, there was lot of noise, but that is part of democracy," the Congress chief said. Gandhi asserted that the Congress will not allow assault on key institutions. "We will have to do a lot of repair works because what was done in last five years is devastating for the country," he said. "For the first time in India's history, Supreme Court judges came out... and said we are not allowed to do our work," he said. The Congress president said he readily accepts criticism. "I am a person who is not critical to criticism. I learn from people and I do not want that everyone should accept my opinion. I do not hate as hate weakens and hatred creates blindness," Gandhi said. He dismissed suggestions that all parties have been neglecting middle-class and stressed that a sizeable section of the society was able to rise above poverty because of the liberalisation process initiated by the Congress in 1991 and between 2000 and 2014. "Congress helped create the middle-class. Our set of policies of liberalisation, frankly, built the middle-class. Now of course you can ask the question about neglect of middle-class to (Narendra) Modi", he said. Middleclass people are facing hardships in spheres of health care and education due to monopolization, he said. RTI and Lokpals are major weapons for the middle-class but "RTI is dead at present", he said..
Monopolization and "capturing" of education and healthcare systems needs to be challenged, he said, underlining the need to invest huge amounts in these sectors. He said there was a need to raise the standards of institutions like IITs by improve the quality of education and infrastructure. "You see how IITs were set up in the 1950s. We all talk of the quality of the IITs, but we must remember that these were set up nearly seven decades ago. We need to see what we can do to take these forward," he added. Regarding jobs, Gandhi said Rs 12.5 lakh crore of India's banking money has been captured by 30 or 40 businessmen. "If you are a small or medium businessman, you have to deal with demonetisation, GST, but you are not forgiven your loans, while Vijay Mallya can run away with Rs 9,000 crore and Nirav Modi with Rs 30,000 crore which is the amount of one year's job volume of MGNREGA. "Anil Ambani can be given Rs 30,000 crore just like that. Some of these monopoliies need to be challenged," Gandhi said. The Congress chief said a small businessman "should also be given similar access to banking and political system as Anil Ambani. And we centralise power. If everything is run from PMO or CMO, only 15 to 20 people close to them will benefit. Decentralisation of power can stop it." This was Gandhi first visit to Odisha as Congress President ahead of the polls.